For context, Nima, with its portable food tester and community data, empowers people with food sensitivities to take the risk out of dining out. As the only Designer at Nima, I lead the design of Nima's products and overall experience: Leadership | Web | Mobile. I’m a human centered designer who (1) empathises with the user experience, (2) defines user needs and product scope, (3) ideates with both the user and business in mind (4) tests prototypes to maximise learning (5) measures results and continues to improve. Below, you'll see how I designed Nima's iOS and Android apps to fit into the daily needs of a Nima user. The app enables the entire community to benefit from every test result. Nima's executive team knew they didn't want to just be a hardware company. Every test result was an exclusive data point that consumers, restaurants, CPG companies, and others would value. I was brought on the team to lead the design of Nima's app, which would enable us to capture and leverage that data. In a agile sprints, I worked closely with our iOS developer, Android developer, back-end developer, and product manager. Define user needs. Needs are verbs, not nouns. By keeping our user needs top of mind, we can design for our users, not for our assumptions. Gather stories. Emotional anecdotes and memorable quotes enabled me to concretely communicate user needs to others on my team. Find extremes. Power users' idiosyncrasies and extreme behaviours inspired app design that could enable more typical users to succeed too. Distill principles. All this qualitative data enabled me to find a definition of successful design by which I could make decisions with stakeholders. Show me how others benefit from my contribution. Give me a sense of duty to the community. Let me enjoy my food. Remind me later. Help me forgive [a gluten-found result] and move on. I designed and prototyped 3 major iterations of wireframes. I studied best practices from analogous review/rating flows (Airbnb, Uber, etc). I sketched a wide variety of possibilities on paper before wireframing two dramatically different approaches. Based on the intersection between user needs and feature feasibility, I prioritised features and scoped them into two buckets: short-term and long-term. This enabled me to focus on the short-term design without wasting time on unnecessary details. I tested these with 2 new users and 2 existing users, asking them to talk aloud and achieve key goals while tapping through the Invision prototype on screenshare. Based on user feedback, I did several UX iterations where I changed the order of steps, removed unnecessary interactions, and updated the language to match users' language. Also based on what people noticed, I identified the UI elements that were most important to the experience and removed any confusion from the layout. Through these 3 major iterations, I visually designed the app with increasing detail: (1) Rough, (2) Functional, and (3) Clean/Consistent. We used many Material Design elements to move fastest. I tested the design for colour contrast and colour-blindness usability. I helped product manage the implementation and made marketing materials for the launch. I collaborated with the engineering team on minor adjustments and micro-interactions during implementation. With our product manager, I studied our Mixpanel analytics data and all app-related Support tickets. Based on behaviour and direct user feedback, we discovered bugs to fix along with language and design elements to improve in the next version. % Tests Contributed increased by 240%. An engaged, contributing userbase is our #1 company objective and the % Tests Contributed (# of Tests Contributed / # Tests Synced) is one of our key results. This release pushed our business forward. In total, Over 10,000 tests have been contributed in over 25 countries. In retrospect, I think we could have launched this first version more quickly. How? By more rigorously prioritising our users' needs and eliminating Nice-to-Have data (ratings, spec-GF, etc) from the flow. Nima's Sensor is a Bluetooth device. Pairing your Sensor to your Nima App is a key part of the onboarding flow before you can sync and contribute any test results. We also need users to pair their Sensors to update their firmware, like the improved device icons I designed. So, this flow is crucial for user engagement not only with the Nima community but also with their Nima Sensor. I studied best practices of other connected device apps (Fitbit, Nest, Nike+, Joule, etc) and assembled the more relevant elements to our brand and design needs. By bringing screenshots of some of these best practices to our engineering team meeting, the team could concretely discuss technical constraints around the pairing flow. I first sketched rough wireframes on paper. I then wireframed two radically different flows. In quick 15-minute sessions, tested both flows with 2 new users and 2 existing users. Users needed to have control over beginning the pairing process. So, I placed the Pair call to action in the context of a user's empty inbox, familiarising them with the structure of the app. Users needed to feel delight during the pairing process -- it was "way too texty". So, I art-directed our illustrator to create simple illustrations for each step. 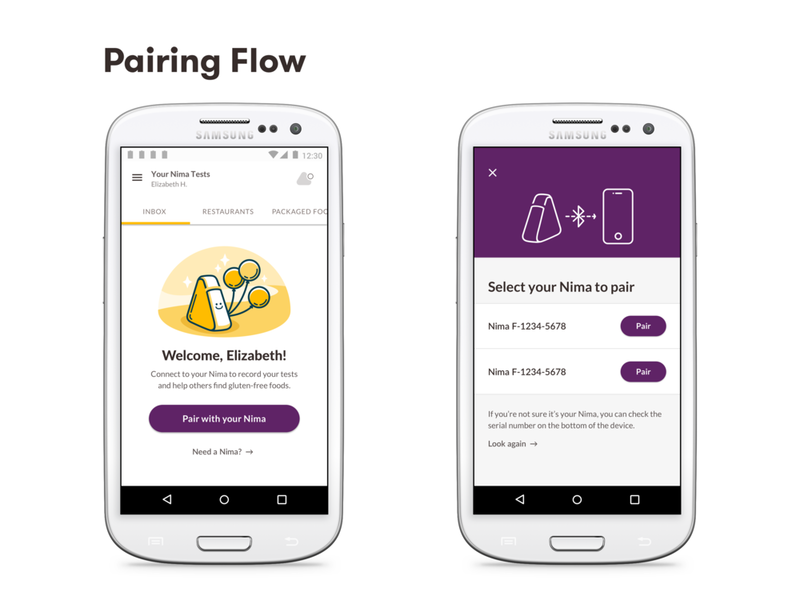 Users felt the illustrations helped them be more patient with the pairing flow. Users needed to see the loading state at all times. I worked closely with the engineering team during implementation on all micro-interactions and transition moments so no state was ambiguous or confusing. Despite extensive bug-testing, we discovered and fixed several Bluetooth-related edge cases by reading Support tickets related to pairing. 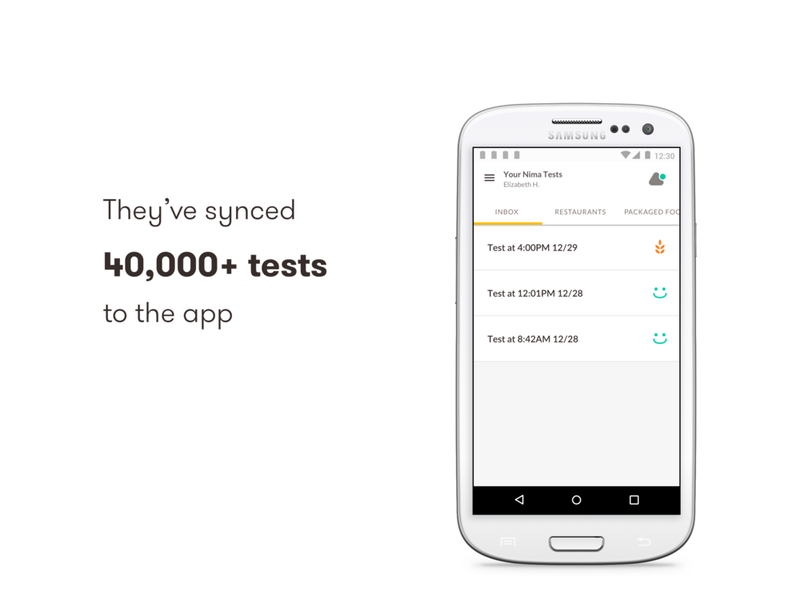 Over 40,000 tests have been synced into user's inboxes. Thousands of users have successfully paired their Nima sensor to the app and updated their firmware. It's rewarding to see firmware updates celebrated on social media (such as the new Gluten and Smiley icons). Support volume about this stage of onboarding has decreased to < 1 ticket per month. The percentage of users with the latest firmware version has increased 40%, since this update. Nima helps people with food sensitivities make dining decisions. Restaurant and Packaged Foods Search enables our users to choose where to go out to dinner, how to plan their travel, and which foods to buy every day. By making our user's test results accessible through a seamless search experience, we help improve food transparency for everyone. Because of their food sensitivities, all Nima users have experienced the health cost of blindly trusting restaurants, caterers, and packaged food labels. They've developed opinionated and refined strategies for dining out, travelling, attending events, and buying snacks. In order to understand their unique methods of making smart dining decisions, I interviewed 6 Celiac users (the same participants as in the first project on this page). I identified key needs around trying new packaged foods, finding accommodating restaurants, and sharing one's discoveries with others, and other provocative topics that enabled me to design the search experience. I designed and prototyped 2 major iterations of wireframes. I studied best practices in search (Google Maps, Apple Maps, Yelp, Foursquare, Uber, etc). I sketched wireframes on paper and tested them "Wizard of Oz" style with team-mates to make core usability improvements. Next, I tested an Invision prototype with 2 new users and 2 existing users, challenging them to find a restaurant nearby, find the best bakery, and look up a snack. Their feedback enabled me to choose the most intuitive search patterns and visually prioritise the information on a restaurant's page. Based on the next step users wanted to take, I designed thoughtful empty states (such as slow/no connection or no test results at a given restaurant) and first-use states (such as asking for location permissions). Over 5,000 restaurants (and over 6,000 dishes) have been Nima-tested and are discoverable in Restaurant Search. Nearly 5,000 packaged foods are discoverable in Packaged Foods Search. Our community app data has become the core of the Nima marketing team's 2018 content strategy: consolidating the most-tested chain restaurants and packaged foods into Nima-tested reports. Based on surveys, 80% of active app users say they use Restaurant Search to find acommodating restaurants at least once a month.